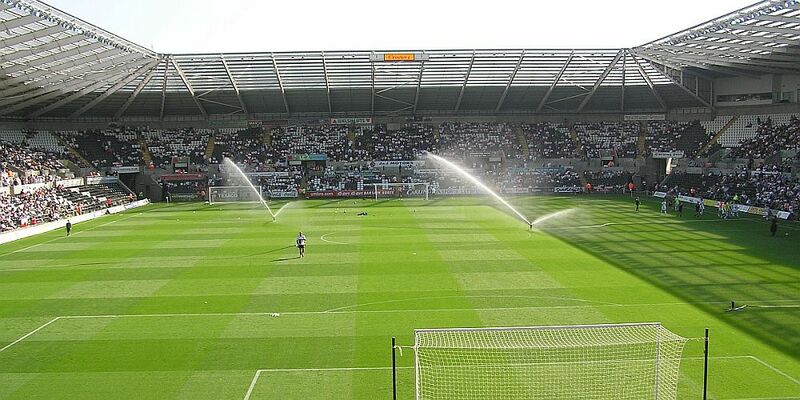 Burnley went into stoppage time yesterday at the Liberty Stadium hanging on to what would have been a valuable point, but a goal in the second minute of the added four put paid to that with Swansea winning the game 3-2. I didn’t spot it at the time, but it is clear that the goal shouldn’t have stood because of scorer Fernando Llorente’s push on Ben Mee. It sort of balanced the nonsensical penalty we were given in the first half and there is no question that Swansea were by some distance the better team over the game and you really couldn’t argue the merit of where the points went, leaving us with an 11th away defeat of the season. Sean Dyche made three changes for this game, two of which were forced on him. Sam Vokes replaced the suspended Ashley Barnes with Jeff Hendrick recalled, after completing his suspension, at Ashley Westwood’s expense. Those two changes were expected but the third wasn’t, the one that saw Paul Robinson come in for Tom Heaton who had been taken ill overnight. Robinson had previously played in the defeats at home to Manchester City and at Stoke. Swansea had picked up in recent games. It had lifted them out of the bottom three but they still looked a team in relegation trouble albeit with some very good players. I’d suggested all week that Gylfi Sigurdsson and Fernando Llorente were of concern and they proved to be justified concerns. The home side got off to a terrific start and could so easily have had the lead even earlier than the 12th minute when Llorente scored the opener with a powerful header from a Leroy Fer right wing cross. Twice Alfie Mawson hit the woodwork, firstly the bar and then the post, and they were giving us a right going over. When that goal went in it seemed appropriate to fear the worst given Swansea’s start but, and with some good fortune it has to be said, we got ourselves level on twenty minutes. Andre Gray got in a good shot. It took a deflection which Lukasz Fabianski saved to give us a right wing corner. That immediately led to a second corner which brought the first controversial decision of the afternoon. Robbie Brady’s corner came over and players from both sides appealed for a handball. Referee Anthony Taylor, who had just returned from his stag do in Marbella, deliberated before, to my delight, pointing to the penalty spot. He was immediately subjected to protests from Swansea players far beyond what is acceptable which certainly had me thinking he might not have got it right. He clearly hadn’t got it right. Vokes was the player who had handled it and Gray, after a considerable delay, hit the spot kick down the middle to draw us level. If that suggested to anyone that a revival was on the way, they were to be very much disappointed. Swansea remained on top for the remainder of the first half. More than once Robinson looked all at sea, Sigurdsson, the string puller throughout with his delivery, hit the post, Martin Olsson, the distasteful 2010 diver forced a good save from Robinson, while Luciano Narsingh, making his first start for the Swans, was a constant threat. That all led to sighs of relief in the away end when the half time whistle blew with us level at 1-1 although there didn’t appear to be a lot of confidence that we could get anything from it. Nothing much changed at the start of the second half. Sigurdsson beat Robinson with another shot with Mee this time clearing off the line and then Llorente headed wide. It was beginning to look as though it might be another long half of football but then we seemed to get more of a grip of things. Swansea lost their momentum although, it has to be said, we definitely weren’t grabbing the initiative, that was until just past the hour when we took the lead. Matt Lowton played the ball forward for Vokes to knock down to Gray inside the box but with his back to goal. He did so, so well to turn and hit a left foot shot into the corner past Fabianski. For only the second time this season we were in front away from home and Gray had just scored our 100th Premier League goal of which he himself had contributed eight, a total currently behind only Danny Ings and Barnes. There was no immediate response from Swansea and for a few minutes it gave the Burnley fans some hope that the first away win was on the way. We might have gone 3-1 up when Gray got down the left. He opted to cross rather than shoot with Vokes just unable to get there. It lasted eight minutes until they equalised. Sigurdsson was obviously going to be involved again and he played a ball in for Olsson although George Boyd’s contribution, or lack of it, here was a major factor. Olsson fired home and with over twenty minutes to go the concerns returned. Those concerns were justified too as Swansea, certainly in the closing stages, gave it everything to look for a winner. Scott Arfield had replaced Brady with the score at 2-1 but with ten minutes to go both Vokes and Joey Barton were replaced with James Tarkowski and Westwood coming on. I have to say I was stunned at Joey’s withdrawal and I’m afraid the changes did not work at all. From that moment on we were simply hanging on. I kept looking at the clock as the minutes ticked down and as we reached 90 the board showed an extra four minutes to go. We hadn’t reached the end of the second minute when the winner went in. Tom Carroll’s cross from the left was met by Llorente whose header went over Robinson and into the Burnley net. Quite simply, just as we should not have been given a penalty, this goal should not have been allowed by Taylor with the Swansea forward clearly pushing Mee in the back and sending him flying. That was it, you knew there would be no comeback from this. Swansea won, Paul Clement went chasing round the pitch like something demented, giving the impression they’d won the Champions League. What they had done is won a Premier League game and collected three points. In doing so, no fair minded person inside the Liberty Stadium could have suggested they didn’t deserve them. They were the better team, in fact they were much better than us and I’d suggest that possibly, with the exception of Chelsea in our first away game of the season, no side has played better against us. As is always the case in a game like this you start to ask the questions as to whether it was because they were so good or because we were so bad and the answer is rarely one or the other. My view was that Swansea were very good. They turned in a performance that left you puzzled as to how on earth they are where they are in the table. Then you remember Bob Bradley. If only they’d stuck with him for a few weeks longer I think they would have been doomed. Bradley was potentially one of the worst ever Premier League managerial appointments. As for us, no we weren’t good, but we we’ve played worse this season, far worse too at places such as Southampton and West Brom along with the second half at Leicester. I think we just got caught with Swansea on a very good day when, as Sean Dyche admitted, we weren’t quite at our best. Having witnessed that, I’ll be amazed if Swansea go down, I really will, although I’m not so keen to go back. As we worked out yesterday, Burnley haven’t won a game in Wales since beating Cardiff in March 2000. Two down, two to go in the away games and rampant Liverpool next. Suddenly people are getting all edgy again but the fact remains we are still nine points clear of the bottom three and I still don’t think we need many more points from our remaining eleven games. That’s eleven, not one or two, for those worrying too much. We have to improve on yesterday but I’m certain we will and I’m equally certain we will be more than OK come the season’s end. Swansea: Lukasz Fabianski, Kyle Naughton (Angel Rangel 89), Federico Fernandez, Alfie Mawson, Martin Olsson, Jack Cork, Tom Carroll (Jordi Amat 90+5), Leroy Fer, Luciano Narsingh (Jordan Ayew 73), Gylfi Sigurdsson, Fernando Llorente. Subs not used: Kristoffer Nordfeldt, Leon Britton, Wayne Routledge, Borja. Yellow Cards: Leroy Fer, Jack Cork. Burnley: Paul Robinson, Matt Lowton, Michael Keane, Ben Mee, Stephen Ward, George Boyd, Jeff Hendrick, Joey Barton (Ashley Westwood 80), Robbie Brady (Scott Arfield 66), Sam Vokes (James Tarkowski 80), Andre Gray. Subs not used: Nick Pope, Jon Flanagan, Tendayi Darikwa, Dan Agyei. Yellow Cards: Stephen Ward, Ben Mee. Referee: Anthony Taylor (Wythenshawe via Marbella).